This photo (courtesy of Kayode Ogundamisi) shows a 419-er holding on to what looks like a ram's horn, to spiritually strengthen his message to the oyinbo on the other end of the line. Of course, the photo could be fake. 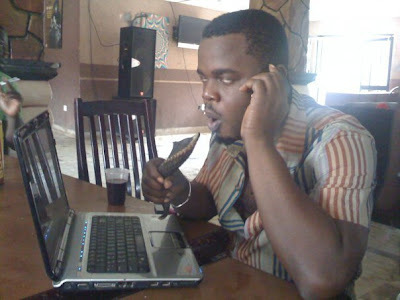 But even if it were concocted, apparently yahoo boys do resort to the power of fetishism, especially in Benin, with tortoises being brought into cybercafes etc. If only but what to do when the enabling environment is missing? I guess the recession has finally hit home! Are they living under a different "enabling environment" from those who have elected to channel their efforts towards non-criminal activity? And exactly what sort of "enabling environment" are those Nigerians who engage in credit, identity and bank fraud ABROAD missing? Those of us who live here in Nigeria realize that it can often be an extremely difficult environment (not least because it is mainly populated by Nigerians...lol! ), but please we should desist in making all manner of excuses for criminals. It takes about as much (and sometimes more) effort of conception, planning and execution for criminal activity as it does for its non-criminal activity.